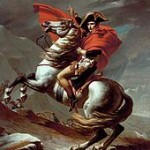 The Napoleon Society of Ireland is a Joint initiative between Finte O’Broin and The Emmet and Devlin Society. It was launched on Robert Emmet’s birthday, the 4th of March, 2012 at St. Catherine’s Church in Dublin the site of Emmet’s execution in 1803. 1. 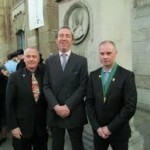 Dr. J. David Markham (President of the INS), Philip Emmet and Derek Byrne of Downes (President of Napoleon Society of Ireland) at the launch on March 4th 2012. 2. 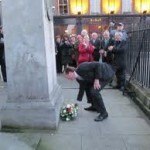 Philip Emmet lays a wreath at the Robert Emmet plynth on the site of his execution outside St. Catherine’s Church on Thomas Street in Dublin 8. Finte O’Broin was proud to be involved in the launch of The Napoleon Society of Ireland and The Emmet Medal, an annual award to aknowledge humanitarian work on behalf of an individual or orgnaisation in an Irish context. The Napoleon Society of Ireland (NSI) will promote the intellectual, philosophical and political links between Napoleon Bonaparte and The United Irishmen. The NSI will also encourage academic research into the role played by Myles Byrne, a leading figure in Napoleon’s Irish regiment. The NSI is proud to be affiliated to the International Napoleonic Society and some of the board members will be attending the launch of the NSI. Each year, The Emmet Medal for humanitarian work in an Irish context will be awarded on Robert Emmet’s birthday, the 4th of March. Both the launch of the NSI and the presentation of the first Emmet Medal took place at 5pm on Sunday the 4th of March 2012 at st. Catherine’s Church on Thomas Street in Dublin 8, the site of Robert Emmet’s execution in 1803.